Few people from history have been as fascinating to me as the courageous and outlandish German monk turned Protestant Reformer, Martin Luther. I am sure that I knew his name and some basic info from history classes in High School or Western Civ. classes in college, but the more I studied theology as a young college student the more Luther began to stand out. It seemed as if he was often being referenced and quoted in theology books. So, when I finally decided to give Luther a thorough survey Bainton’s biography of him was the most recommended. But Here I Stand did more than just give me information about the Protestant hero. This book inspired my faith to trust deeply in God. 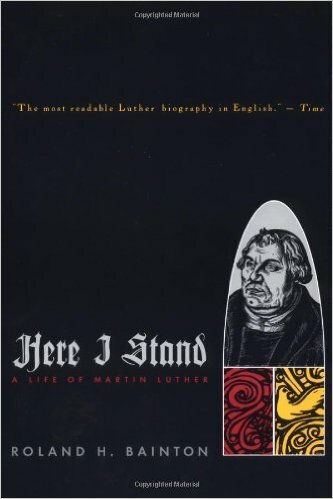 Roland Bainton’s biography is arguably one of the best you will ever read on Martin Luther. Bainton was an expert on Luther, and a specialist in Reformation history. So, it was no surprise to find that this Yale historian’s book on Luther would be the most recommended. But it’s not just historically accurate, it’s amazingly written. Bainton writes like a novelist, and Here I Stand reads as a compelling story. Every time I’ve read the book I’ve been amazed at how well written it is, how engaging the prose, and how fascinating the plot development. It is one of the best biographies I have ever read. It set me on a course to love Luther. The book unpacks both Luther’s life and his theological developments. Bainton is able to set the man within his context well, and give us a broad picture at times of what the world looked like during the period of the Reformation. The book balances well between academic work and accessible biography. It certainly had a high impact on me and became a book I read through often. Unless I am convinced by the testimony of the Holy Scriptures or by evident reason-for I can believe neither pope nor councils alone, as it is clear that they have erred repeatedly and contradicted themselves-I consider myself convicted by the testimony of Holy Scripture, which is my basis; my conscience is captive to the Word of God. Thus I cannot and will not recant, because acting against one’s conscience is neither safe nor sound. God help me. Amen. The phrase “Here I stand, I can do no other,” is believed by many scholars to have been added at a later time. It is not original to the earliest printed versions of the speech. Bainton, however, includes it without qualm or question and he clings to it for the title of his book. It, for him, highlights two great truths of Luther: boldness and dependence. Luther was bold. In fact as the Reformation carried on he was defiant and belligerent. He had no patience for the church after his excommunication. He had no patience for the Pope or the church’s many teachers. He had no patience for theological debates devoid of reference to the Scriptures. He welcomed in runaway nuns, helped them get married, and continued to write long after a Papal Bull declared him the antichrist. I simply taught, preached, and wrote God’s Word; otherwise I did nothing. And then, while I slept, or drank Wittenberg beer with my Philip [Melanchthon] and my Amsdorf [Nicholaus von], the Word so greatly weakened the papacy that never a prince or emperor did such damage to it. I did nothing. The Word did it all. Such truths, at the time I was discovering Luther, were astounding to me. As a young man I had been quite clueless about sound doctrine, church history, and even the Scriptures themselves. Bainton’s story of Luther made such things seem like an adventure. He helped me to see how counterculture dependence upon the Word of God was, and how much faith I needed to go into full-time ministry. This book helped me to love theology, love the Scriptures, and the love the church. Luther’s passion for those things became contagious, the jumped off the pages of Bainton’s biography. I was mesmerized by Luther’s passion and energy. I went on to study Luther for a year, and quite honestly have never stopped studying him in bits and pieces since then. Luther, for all his many faults, has become a sort of hero to me. I owe that to Roland Bainton. The book helped me, even more significantly, to put a deeper trust in God. I have often been driven by my own desire for acknowledgement and accomplishment. I have put an emphasis on my abilities. But Luther’s story came to life in my heart. It drove me to love God’s Word more deeply and to see my need to depend upon Him. He strengthened my already blossoming faith in God. I was a Christian at the time of reading this book, but I was an immature Christian. Luther’s story displayed deep faith for me and inspired me in ways that I can’t even begin to express. For that reason Here I Stand had a great impact on my faith.